4.2 out of 5 based on 48 bloggers and 18 commenters. 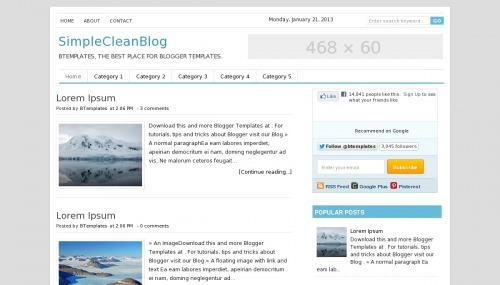 SimpleCleanBlog is a free blogger template with 2 columns, right sidebar, minimalist, an exclusive design for Blogger, ads ready, posts thumbnails, drop down menu, breadcrumbs, related posts support and well designed threaded comments. Excellent template. i like so much. my site so flexible and simple. thank you so much. I accidentally deleted the comments box. Is there any way to restore it? Or is this a Blogger issue? Had it working for a while. But once I added a page they page widget auto saved to side links and it wouldn’t remain on top. Solution on google didn’t work. Thnx for sharing Its really look awesome. Nice and very simple but powerful, instantly I use on my blog. I removed li tags in edit html but those links still apear in menu bar..How to fix that? I cannot seem to get the labels out of the footer. Can you please tell me which label code to remove? ShareThis code does not display in the post when I put it in properly. Other than these two things I love the tempate, but can you please help me fix these? How can I change the colors? cukup simple dan oke. aku coba untuk blog saya..
i like this tamplete. but how to edit this tamplete? Is there anyway to adjust the width of the template? or the posts and sidebars? Hai, this is cool and simple template, i am using it, but search is not working, how to fix please help me….?? ?